Examples of corporate Pride branding. Otherwise known as pink capitalism or gay capitalism, Rainbow capitalism is when businesses incorporate queerness and the LGBTQ+ rights movement into their marketing, products, etc. in order to capitalize off of the purchasing power that queer people have. Rainbow capitalism was a move by companies to market themselves as queer friendly to get LGBTQ+ consumers to buy their products. Rainbow capitalism was also designed to take advantage of the new wave of allyship for queer people. It thrives in part because of the acceptance of white gay, cisgender people, while erasing queer POC, because in our society those people aren't as 'socially accepted' in terms of consumption. Ultimately, rainbow capitalism emerged because LGBTQ+ people wanted to support businesses that supported them. Why wouldn't we want to put our dollars with people who weren't trying to oppress us? Why is Rainbow Capitalism Harmful? Rainbow capitalism centralizes coroporate interests and profit, thus making capitalism in general central the center of many Pride events. With Pride themed merchandise and Pride centric branding, corporations benefitting off of rainbow capitalism have taken over the spaces that were created for queer people, ultimately making Pride less about protests, rights, and liberation, and instead, a way to turn a profit. Unfortunately, the side effect of rainbow capitalism has resulted in Pride becoming more about consumerism, and people visibly 'showing' their allyship through purchased goods, rather than being rooted in activism. This actively erases queer oppression and homophobia. By ignoring the root causes of queer oppression, the history of Pride, and the ongoing violence enacted against different intersections of the queer community, rainbow capitalism sweeps the core of Pride under corporation's colourful sponsored banners. As a result of wanting to be represented in the mainstream, queerness has become a type of commodity. It becomes easy to forget that buying Pride themed items from major corporations doesn't actually do anything to support the LGBTQ+ community. Now, it's simply easier to buy a 'love is love' mug from West Elm rather than address the queer youth homelessness in North America. It's easier to pick up a cheaply constructed rainbow flag for free at Winners, rather than educating yourself about discrimination from police officers to POC and standing up with Black Lives Matter in their activism efforts. It is easier to outwardly show our support for the LGBTQ+ community by changing your Facebook profile banner during Pride month, or by buying a shirt with a rainbow heart on it, rather than addressing the deeper issues and inequalities that we individually perpetuate, and educating yourself on the issues that the queer community, particularly queer POC face. Rainbow capitalism has simultaneously made the LGBTQ+ community visible and invisible. 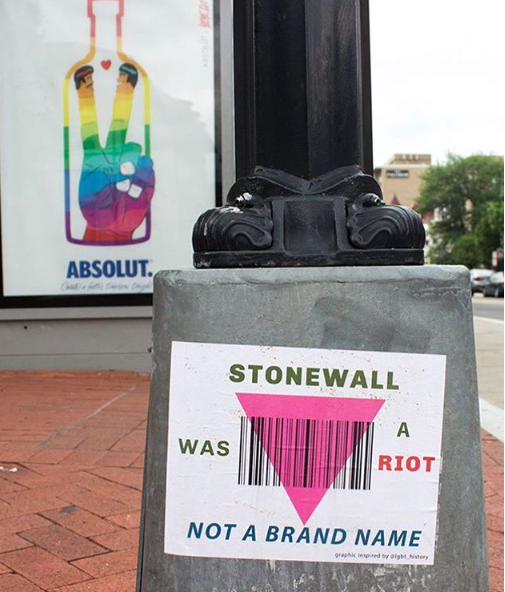 By profiting off of queer people and allies, it silences those that are fighting against exploitative capitalism that harms not only the queer community, but those making the clothes. 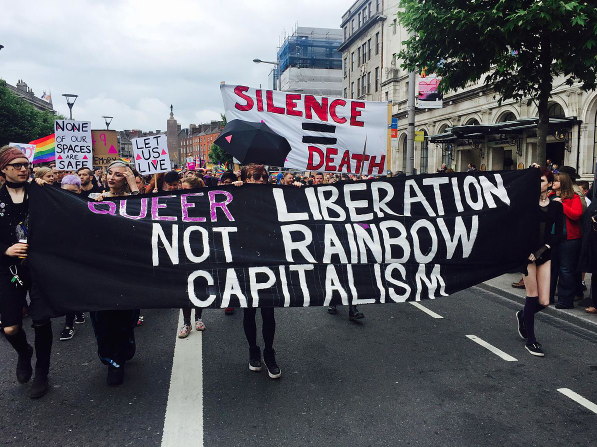 Queer protesters at Dublin Pride in 2016. Image from Google. 1. It actually starts with you. Ask yourself "why am I wanting to wear/buy/adorn myself with this item?". Genuinely investigate your motives, and sit with whatever comes up. Is it because you want to support an organization with your purchase? Is it because you're queer and want to show your pride? Is it because you want people to see you as an ally and you want the congratulations? Your motivation and intention behind purchasing an item - regardless of it's from a major corporation or small business, is important. 2. Look into whatever company you're buying from. Like any other research into a company's ethics, investigate, investigate, investigate. - Find out how long the company has been involved with the LGBTQ+ community. - Find out if they donate to an LGBTQ+ organization that is actually supporting the community. If they aren't, find out why. - Look and see what the company is supporting and investing in. If they are plastering their windows with Pride stickers, but simultaneously investing in pipelines that invade indigenous land...maybe rethink if that company has the right values. - See if they are supporting the queer community outside of Pride months. Do the rainbows only appear once a year? - Investigate where your money is actually going when you buy the product. If a company gives 50% of proceeds to a charity, find out where the rest of the money is going. Is the company hiring queer photographers, models, service people, workers, etc. for their marketing? Is the company producing their clothes under ethical conditions? If at the end of the day, the money is still going to end up in the pockets of rich, white, men and women, then go back to step 1, and ask yourself why you want to still buy the item. - Look into the company's anti-discrimination policies. Are LGBTQ+ actually protected in the workplace? Are queer people being hired and supported? Is the wording of their policies gender inclusive? 3. Support small business, especially those owned by queer people of colour. This whole blog has been about the impact queer people and allies have on the market. Instead of supporting a mega corporation like Gap or Converse, shop small, and get to know the person you're supporting. 4. Try not to support Pride events that are entrenched in rainbow capitalism and corporate capitalism. Pride was originally a protest, started by trans women of colour because police and society enacted violence against them on a daily basis. Though the first Pride seems like it was so long ago, supporting Pride events that have been taken over by corporations and the police does a disservice to the queer people that started Pride, and to the queer people that are oppressed and harmed daily by these institutions. 5. Support organizations working towards queer liberation rather than rainbow capitalism. There are many people organizing and protesting a variety of issues. Maybe instead of buying a tshirt, donate to their cause directly without anything in return, or volunteer your time with them. Is all Rainbow Capitalism bad? This post doesn't mean you can't wear or show your Pride. I have peices in my wardrobe that I wear to let people know that I am queer and proud. For some queer people, Pride merch is a way for us to express ourselves and our identities, and I never want people to feel as though they can't express themselves. I also understand that going to Pride events unites our community, and is sometimes the only day we can be visibly queer. It is in no way to shame you if you enjoy going to Pride events, or wear Pride clothing. This post is simply to challenge you to consider your purchasing power in another way. I talk a lot about being conscious about where you spend your money, and to me, supporting a business that doesn't actively work at being supportive to queer organizations and communities doesn't line up with my ethos of being a conscious consumer. Being able to support businesses that are queer owned or support queer people is incredible. Just remember, you can don all the rainbows and sparkles you desire, but maybe first check to see if your money could be better spent on queer liberation projects, rather than a shirt made in inhumane conditions.